Online shopping is a boom! Really big boom, heard of the largest online shopping site in China called Taobao that was launched in 2003. 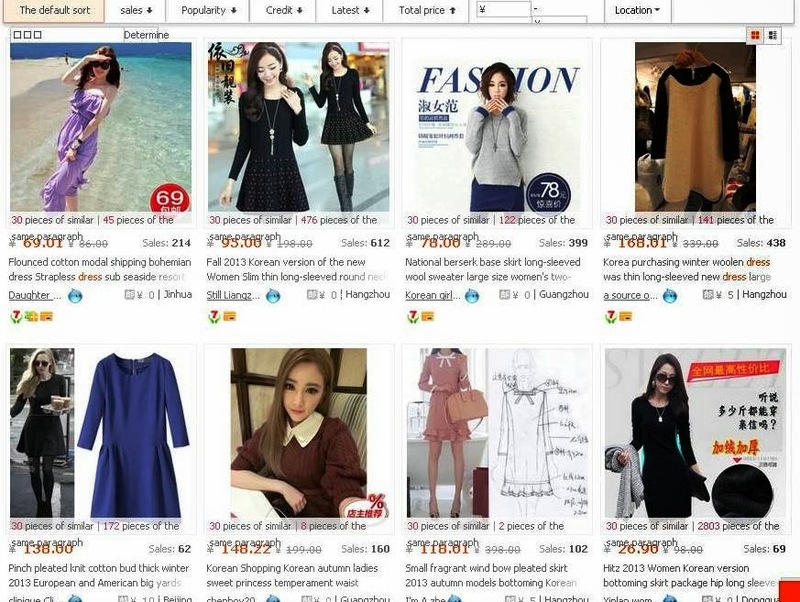 Now it has became the most popular consumer-to-consumer (C2C) online marketplace in China. Wah!! See with more than 800 million product listings and more than 500 million registered users as of June 2012. I also want to know what is so special and how good the deal. 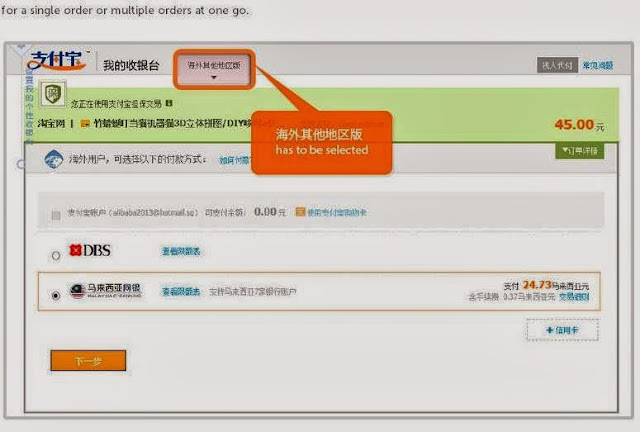 Previously overseas online users are not able to make any transaction via Taobao but now tadah!!! I was introduced to Taobao Southeast Asia (SEA) Online Shopping site. Come! Now is the time for some serious online shopping. Don’t scream ok! 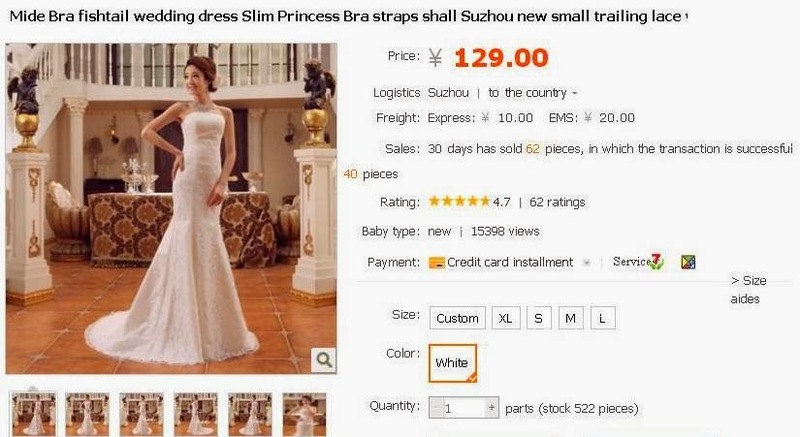 I am going to show you a wedding gown that will only cost you RMB129, about RM65. Ok I want to brief you once and for all, at Taobao, everything is calculated in RMB. Well the exchange rate is almost half of RM, if RMB100 so is about RM50. However the exact exchange rate is determined by the bank that issues your credit / card. I know the website is in Mandarin, for those who do not understand mandarin it might be a bit confusing for you. 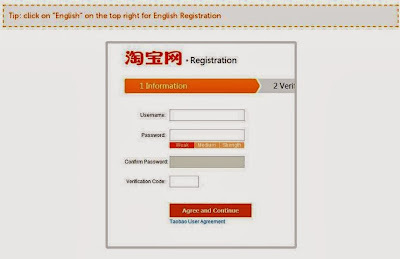 Never mind, you could click to translate to English the button is on the right hand corner. 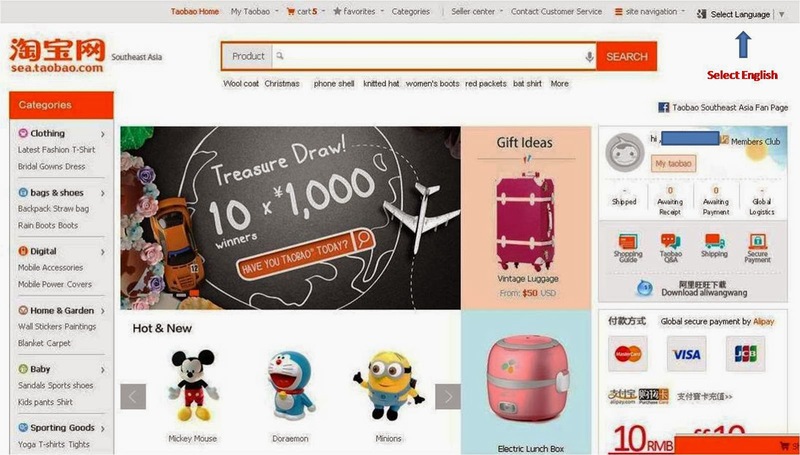 What else is available at Taobao Southeast Asia? I think almost everything from women and men’s clothes, bridal gown, women accessories, bags, handbags, women and men’s shoes, boots, digital and electronics products such as handphone, notebook, computer accessories, kitchen necessities, home and garden accessories, baby products, toys, maternity needs, sports apparels and many more. 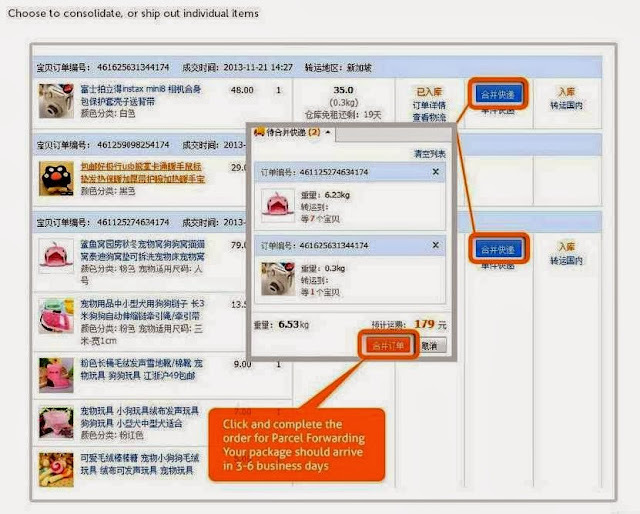 There are 800 million products available in Taobao SEA, you name it they have it. Step 1: If you are a first timer click on Member Registration and follow the steps, create password, included your email registration and key in the sms code you receive on your mobile. Completed you are now a Taobao Member. Step 2: Start shopping by browsing through the website and select the products that you want and add in to your shopping cart. You can also check out the product description, reviews and ratings. Step 3: Start Adding your order or the items that you would like to purchase in the cart. There are a lots of categories. Step 4: Confirm order and key in the receiver address. Follow the instruction. Usually only. You have change it to the Mandarin version so the the link to the forwarder will appear. 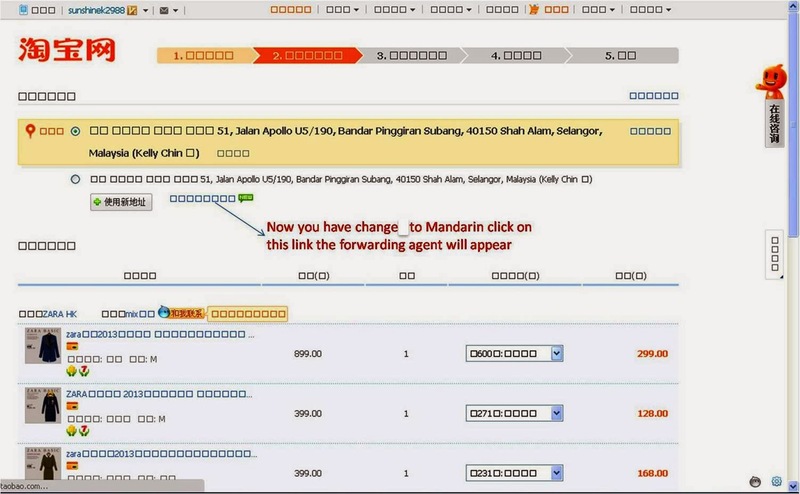 Step 5: Link to forwarding agent. Step 6: Select your forwarding agent according. Once you have done with your shopping, now it’s time choose the forwarding agent. Step 8: Confirm payment and you are done. Then go to your My Taobao, the button is top center and click buy baby there you could see your transaction and track your shipment. Step 9: Once your orders reached the assigned forwarding agent. The forwarding agent will consolidate and weight your total shipment / parcel. Then will you inform about the total freight forwarding charges. Step 10: Once the forwarding charges is clear, then the package will be ready in 3 - 6 days. 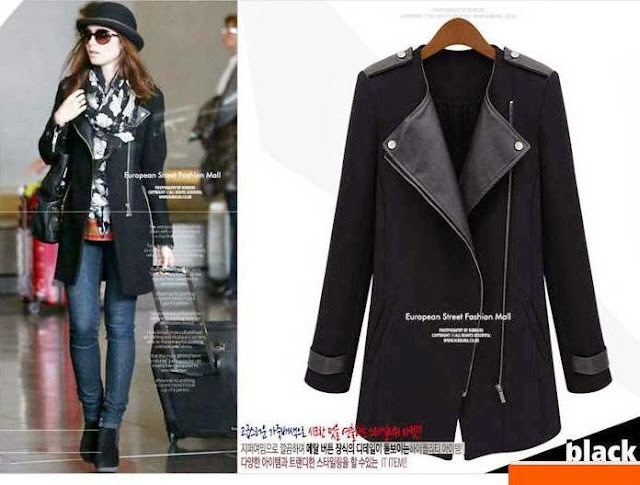 Overall, I find that the products at Taobao SEA are more reasonable and cheaper after discount than at the outlet. Plus this website has lots of varieties of products especially women’s stuff. The only obstacle for me is when I did my transactions because I do not understand Mandarin. 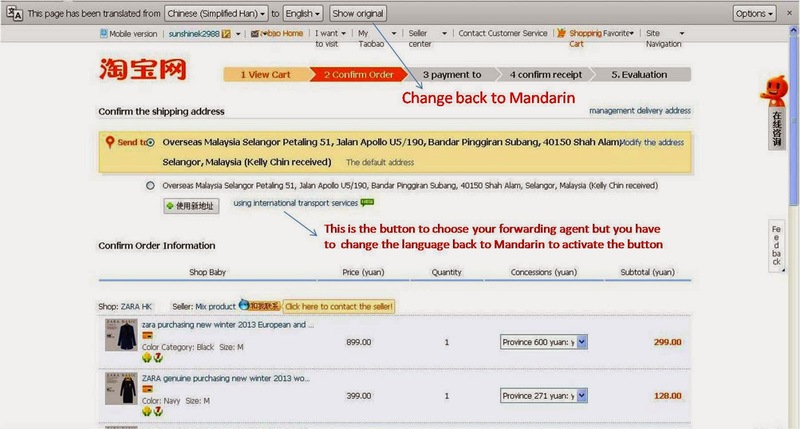 Certain steps especially when it comes to select forwarding agent and making payment in Mandarin. However, after trying out and checking with my friends, then I understand the steps, it is not so complicated. Hey! My eyes go gaga when I browse through the ladies shoes and clothes section. Lots of trendy and chic stuff plus some international brands too. Omg! 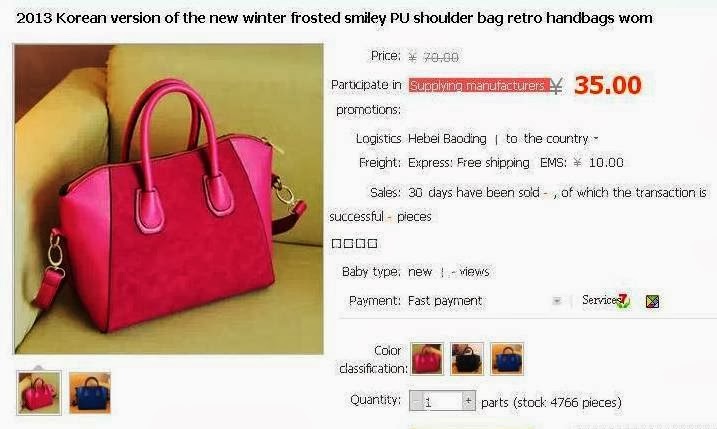 Some of the handbags, clothes and shoes are really like factory price. 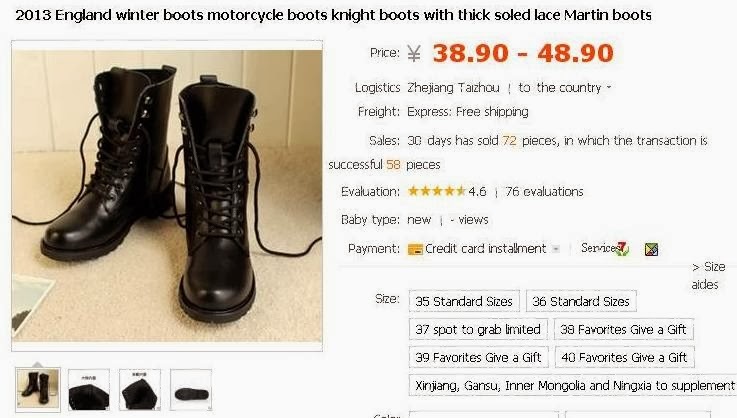 Now you have see what Taobao SEA have and I am sure after this you will go crazy shopping especially girls… OMG check out the dresses, handbags and shoes, crazily good deal with the promotion is even better. Sweet! I am going to reward 3 of my followers for a shopping spree at Taobao SEA Website. So each of you will win RMB500 to buy anything you could wish for. 2. Like Miss Sunshine Facebook here and like Taobao Southeast Asia Facebook here. 3. 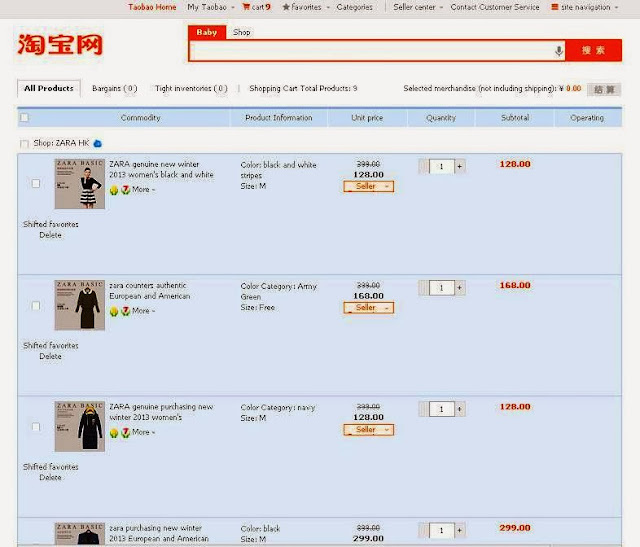 Leave a comment below by telling me 1 item that you really wish to purchase from Taobao Southeast Asia and why? You can join as many times as possible and each time you gain 1 chance for the lucky draw. However, you can only comment 1 time per day and must give a different item each time. If fail to do so will be disqualified. Answer: I love ZARA Genuine New Winter 2013 Women's Black and White Striped Dress because it is chic and stylish and I need it for my winter holiday soon. 1) This giveaway start from 19th Dec 2013 till 05th Jan 2014 (11.59pm). 2) You can comment as many time as you like but you can only win once. 3) Winner will be select via random.org so everyone have a chance to win. 4) This giveaway is open to Sunshine Kelly blog followers and Malaysia residents only. 5) Winners must response within 2 working days after the result is announced, if not the prize will be snowball to a new winner. Now! 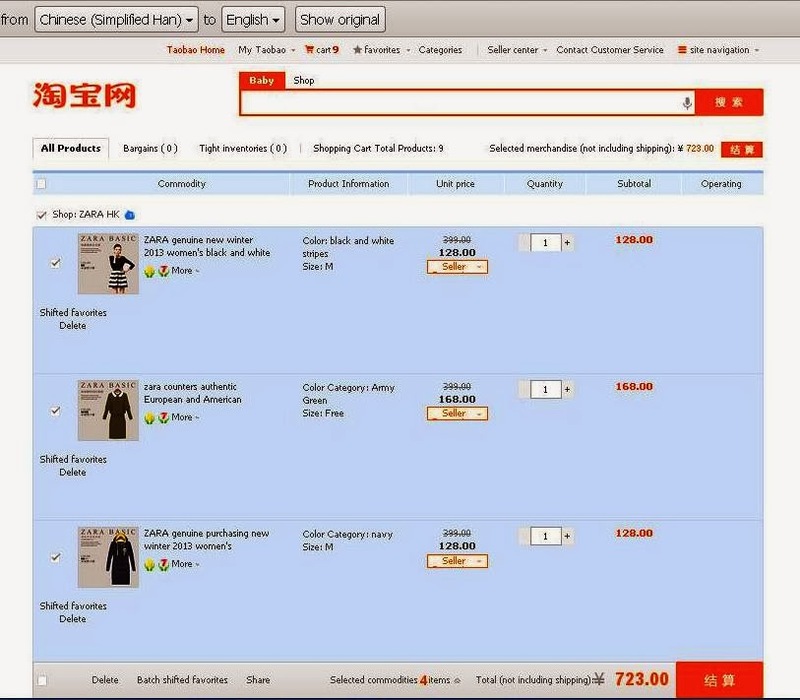 Fold up your sleeve, start browsing Taobao SEA site and search the items that you wish to buy. Join this and get ready to win the RMB1,500 (3 x RMB500). Giveaway start from 19th Dec 2013 till 05th Jan 2014. All the best.